Chocolate and peanut butter is a popular combination in our kitchen. In fact, I think it might be our absolute favorite dessert flavor. We really can’t get enough chocolate peanut butter anything! 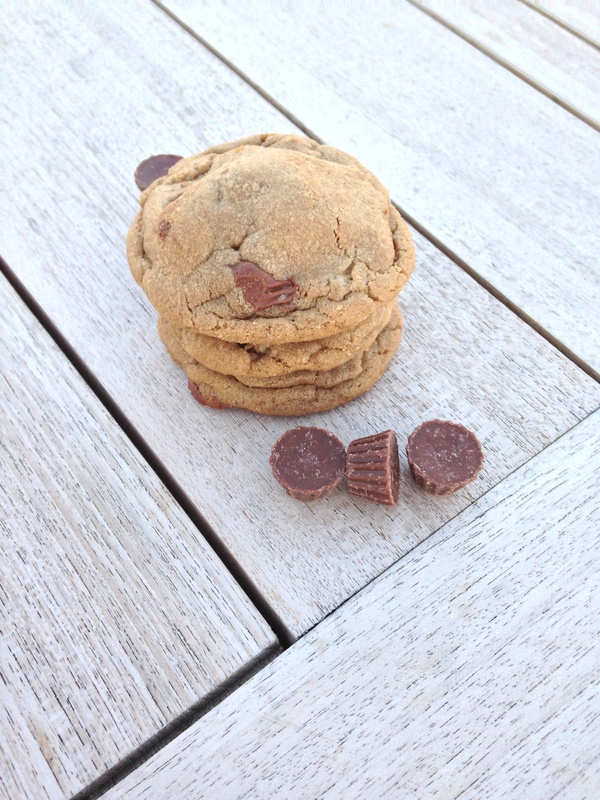 I bought the cutest mini Reese’s peanut butter cups the other day, and they were just begging to be baked into a delicious peanut butter cookie! Let me tell you, these cookies are dangerous. 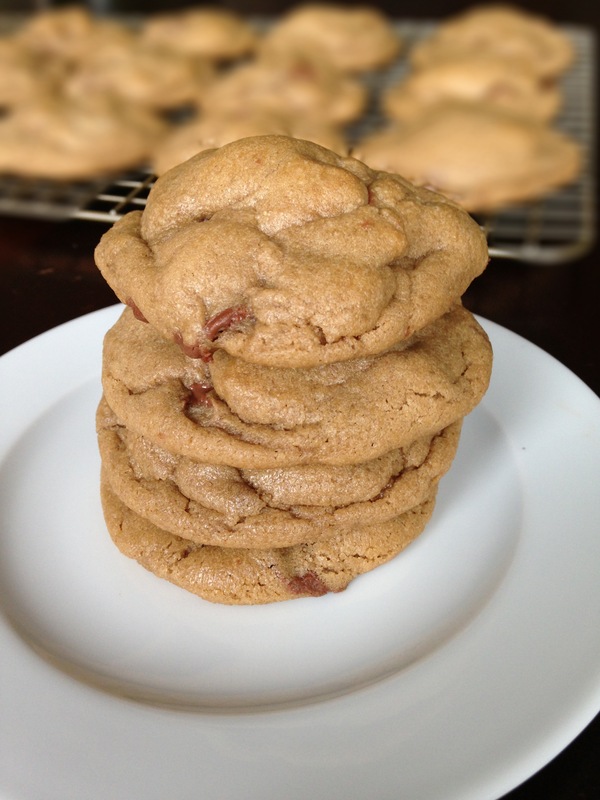 It is impossible to stop at one and still pretty hard to stop at 3… The cookie is so soft and chewy , and has a slight caramely flavor from the brown sugar. 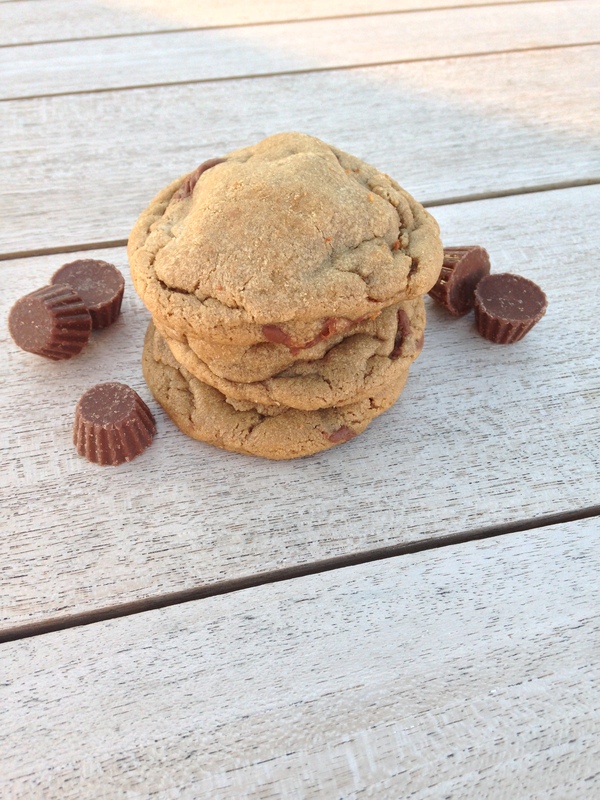 The peanut butter definitely shines through, and the mini reese’s get soft and melty. They are seriously addicting! In a large bowl, use an electric mixer on medium speed to cream brown sugar and butter until light and fluffy, about one minute. Add peanut butter and egg, and beat until creamy. In a small bowl, sift together flour, baking soda, baking powder, and salt. Stir dry ingredients into wet ingredients. Stir in peanut butter cups. Chill dough for at least 2 hours and up to 24. Shape dough into 1 1/2 inch balls, and place about 3 inches apart on ungreased cookie sheet. Bake for 8 – 10 minutes, or until light brown. Cool 5 minutes, then remove from cookie sheet to wire rack. oh my goodness. I am drooling. Peanut butter cups are one of my absolute favorite candies. 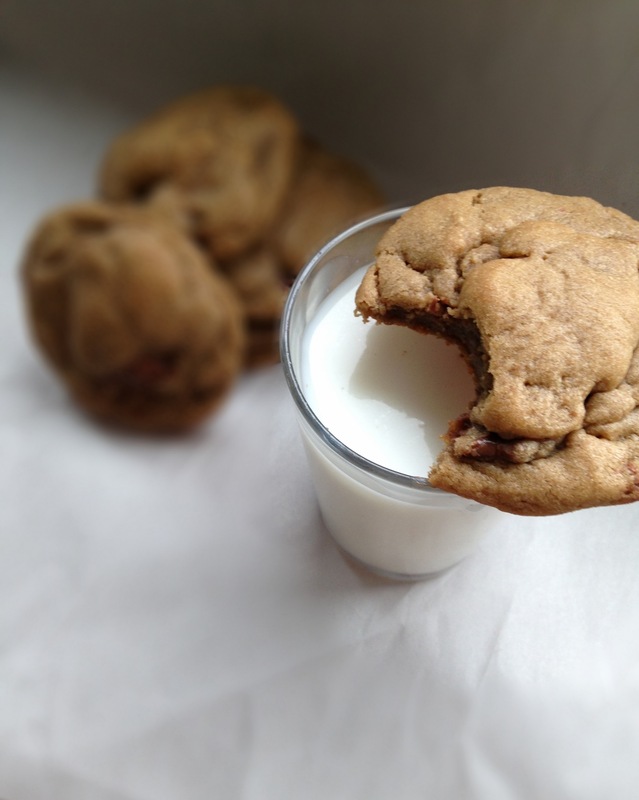 These cookies look seriously amazing! Thanks, Aimee! 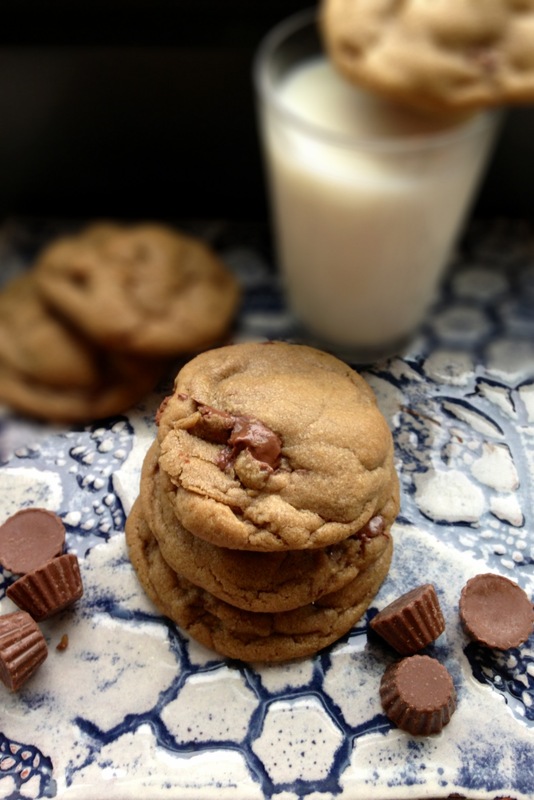 I LOVE pb cups too, hence I LOVE these cookies!! Can go for a couple of these right about now! I’m so sad that they are all gone, I really want one right now too! These cookies look delicious! I’ll have to try them. Do you have a Trader Joe’s near you? If you do, try their mini peanut butter cups. I think they’re better than the Reese’s! Thanks for the tip, Danielle! I haven’t tried the Trader Joe’s pb cups – I will put them on my list for my next TJ run! That’s such a clever idea to put sweets in your baking! Wowza! 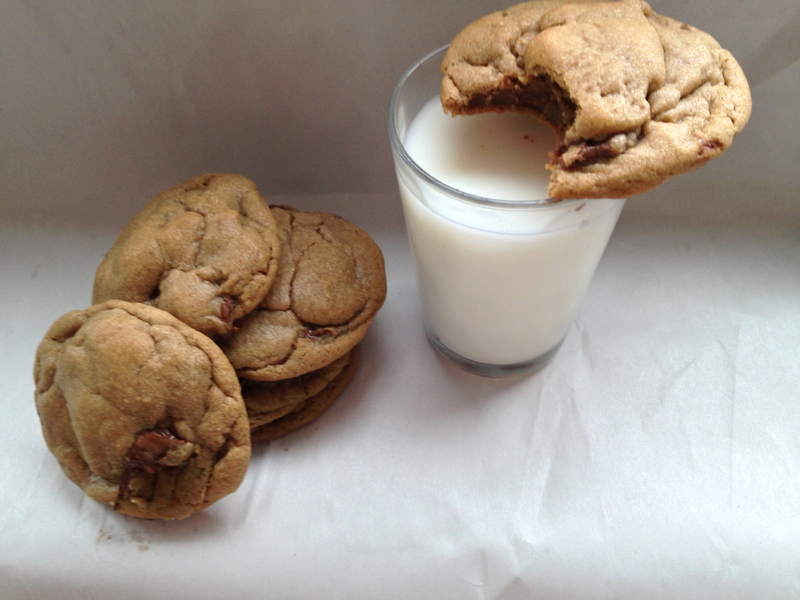 These look SO perfect for dunking in a tall glass of milk! They really do beg for a glass of milk!! these look so amazingly good! now i want pb& chocolate! !